Rosh HaShanah (literally, “Head of the Year”) is the Jewish New Year, which marks the beginning of a 10-day period of prayer, self-examination and repentance. This period, known as the Yamim Noraim (Days of Awe or High Holy Days), is widely observed by Jews throughout the world, many with prayer and reflection in a synagogue. There also are several holiday rituals observed at home. Rosh HaShanah is celebrated on the first day of the Hebrew month of Tishrei, which—because of differences in the solar and lunar calendar—corresponds to September or October on the secular calendar. Customs associated with the holiday include sounding the shofar, eating a round challah, and tasting apples and honey to represent a sweet New Year. 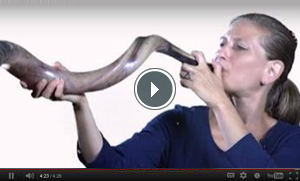 Rabbi Leora Kaye explans the ritual of blowing shofar.